This winter has, so far, been rather uneventful. No arctic deep freeze with snowstorm after snowstorm rolling in like the past two winters and many before that. It's been grey and dull and quite boring, with only The Lakes being frozen over to provide a sense of winter and the opportunity to skate. Older people - including my dad - will wax lyrical about the three legendary winters back in 1939/40, 40/41 and 41/42. It was in 1941 that the municipality of Frederiksberg - where Copenhagenize Consulting is also based - needed some new ideas about clearing the obscene amounts of snow. Horse-drawn ploughs were in use all over the nation, as well as teams of men with shovels, due to the petrol shortage during those winters. 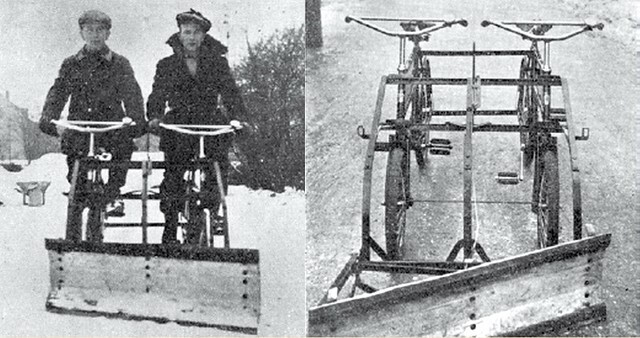 Frode Nielsen, an engineer at the city's transport department, invented the bicycle snowplough picture above. It was made from two short john delivery bikes attached together with rods. The plough was made of beech, with a 3 mm steel edge, as well as small skids to keep the blade from catching on uneven surfaces. You could, of course, operate the snowplough dressed as dapper as you like. We got sent some films of modern versions. Great stuff!